Respond with incident response & IT forensics appropriately and effectively to malware infection, hacker attack, fraud, data theft and other criminal or unwanted digital activities with the support of our highly skilled first responders and certified IT security and forensics experts. Our specialized first responder team provides competent and dedicated support so you can respond fast to cyber security incidents. Our incident response service gives you direct access (upon request 24 h x 365 days) to our pool of experts and includes an initial workshop to ensure seamless collaboration. To prepare for cyber security incidents, we offer incident response/digital forensic readiness assessments and incident response courses. If your focus is on a comprehensive investigation of a cyber security incident, our IT forensics team comes into play to examine data on digital devices like computers, mobile phones, memory sticks, etc. and to find answers to the questions: who did what, when, where and why (how). Examples of incidents which may trigger IT forensic investigations are: Malware infection, hacker attacks, data theft, data leakage, fraud, mobbing, intentional deletion of data, possession and provision of digital media with illegal content, etc. Oneconsult’s first responder & IT forensics expert team supports you in professionally carrying out incident response, forensic investigations, defining your organization-specific digital forensic process incl. use cases and training scenarios and in training various target groups (e.g. IT department, IT security team or IT forensics team). Of course, our incident response and/or IT forensics SLAs are tailored to your individual needs. Our customers benefit from a very short reaction time, pragmatic approach and our vast IT security knowhow (malware analysis, APT tests, incident response, client audits, reverse engineering, etc.). 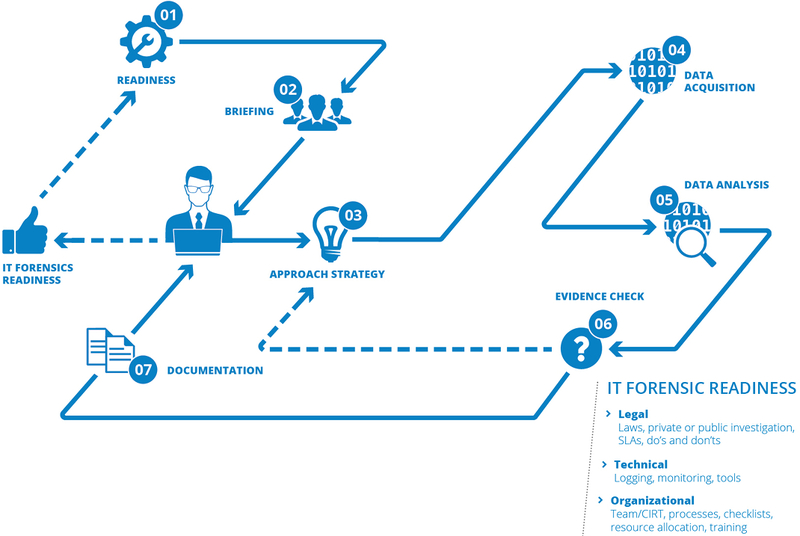 Each of our IT forensics projects starts with a kick-off meeting (briefing) to make sure we understand your specific requirements and expectations, agree on basic conditions and clarify open points. Our digital forensics experts hold GIAC Certified Forensic Analyst (GCFA), GIAC Certified Forensic Examiner (GCFE) and GIAC Reverse Engineering Malware (GREM) certifications and also often carry out complex digital forensic projects. Our clients appreciate our prompt, professional and discrete service. We have conducted over 200 digital forensic and emergency response projects and have disinfected and hardened thousands of hacked and malware-contaminated systems. On average, we conduct 2-3 digital forensic investigations per month for law enforcement authorities as well as law firms, companies and administrations.